Everyone with an Android smartphone or tablet, listen up: starting now, you can use portatour® as Android-App. 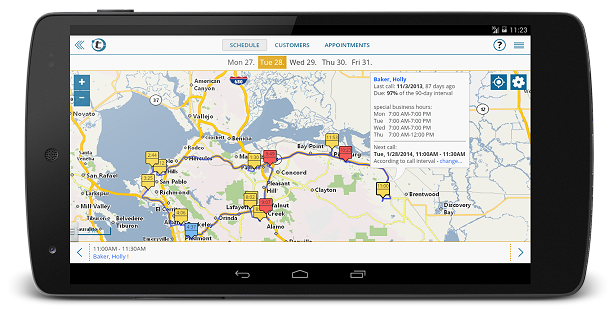 portatour® is the personal route-planner for field sales reps, consultants, and service team members. Routes to customers are automatically scheduled and the route is optimized. Drive up to 25% fewer miles, visit more customers. Suited for independent sales reps and corporations of any size. Used successfully by thousands all over the world – Samsung, Johnson & Johnson, and the Würth Group are just a few of the happy portatour® users. Start today and download the portatour® route-planner from the Google Play Store. Requires Android Version 4 or higher. Install the app and get started with a free 30-day trial using the full functionality. Import up to 3000 customers directly from your Android address-book or from an Excel spreadsheet and start route planning. Note: portatour® is a web-app and requires an active data connection. Your information will be synchronized with the portatour® cloud – you can access the portatour® route planner from PC, Mac, notebook, tablet, and smartphone, too. Whether you want to visit more customers, increase your revenue, or save miles: use portatour® for route planning to reach your goals. More information about portatour® at www.portatour.com .